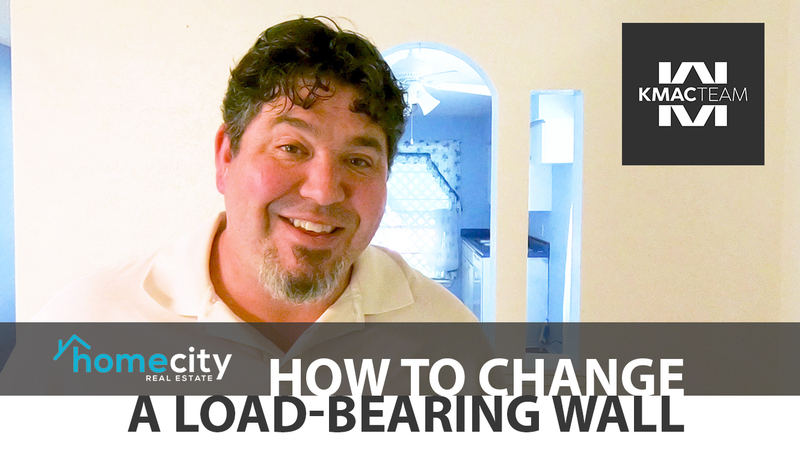 I am at a home my client just purchased to talk with you about how to restructure a home's load-bearing walls. Today I am at a home that one of my clients just bought. It is a fantastic house on a great lot with a great location and floor plan. There is just one thing wrong: a wall that separates the dining space in the kitchen and the living room. As you can see in the video, this home has a good-sized living room that would be connected to the dining space were it not for two walls connecting to corner off the kitchen space. Removing these walls will be a major renovation because they are load-bearing. In fact, the corner is actually carrying some of the load from the roof. What we want to do is be able to carry the load from the kitchen's corner to the main wall. This can be done by adding an exposed beam or leaving a support column. The best option for this particular situation is to add the beam in the attic and restructure the roof to the beam. Outside, as you can see in the video, you can envision cutting a hole in between two pieces of trim and fitting in a glulam beam into the attic to restructure the room. By securing the glulam beam to the main outer wall and positioning it on the already existing support, you can restructure the roof trusses and then remove the entire wall because all the weight has been shifted. This sort of renovation stuff excites me. In this case, the situation is poised perfectly to take the wall out because the roof structure and how you can install the beam. It is not too expensive because you can take the wall out yourself after the beam is installed. If you would like any renovation advice or are interested in buying or selling, please feel free to contact me. I look forward to speaking with you soon.